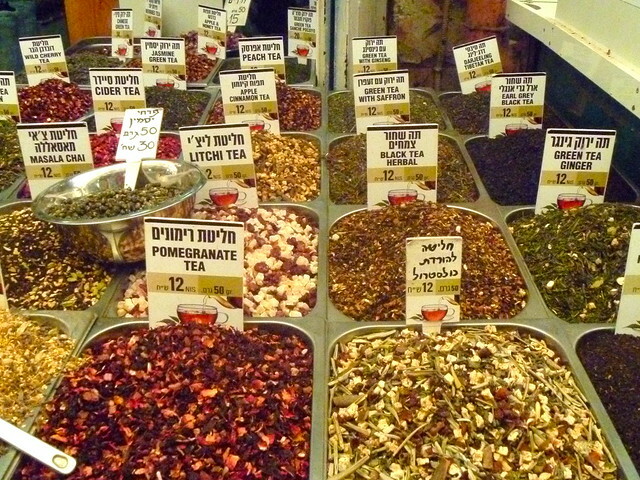 Mahane Yehuda Market quickly became one of my favorite places in Jerusalem. 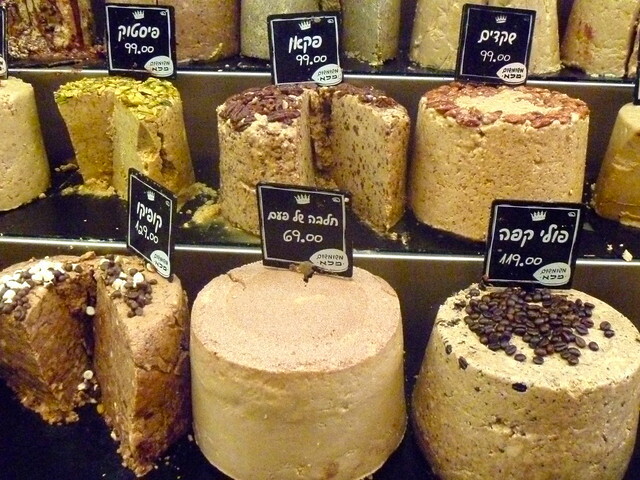 I love local markets (shuks, as they’re known in Israel), and this is maybe the best one in the country. Since I was staying at Abraham Hostel, just 5 minutes down Jaffa Road from the shuk, I was there pretty often. The market is actually much bigger than it first appears. There are two long parallel aisles, one covered by a roof and the other open air, that form the main area. But between these are little twisting alleys that curve around and are also chock-full of shops. I missed most of these on my first visit, and then when I started to discover them I kept going in to explore and then coming out in a completely different section than I expected! This is above all a food market — there’s little if any clothing and tourist tat. But they have so many different kinds of food! Fresh fruits and vegetables are just the beginning. 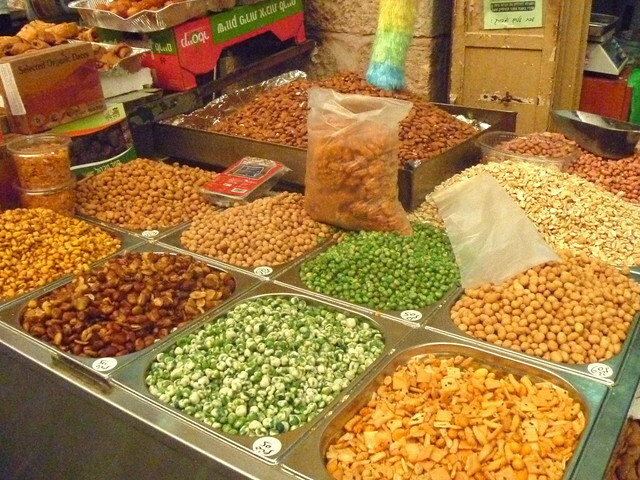 There are also vendors selling every kind of dried fruits and nuts you can imagine, so it’s a great place to stock up on snacks to stash in your backpack. Then there are vendors with refrigerated cases selling cheeses, salads, and slaws… the sheer variety of pickles and olives can be overwhelming. One of the smaller side paths seems to host mostly butchers and another is for fishmongers, but it’s not necessarily an organized floor plan. Then there’s dessert. 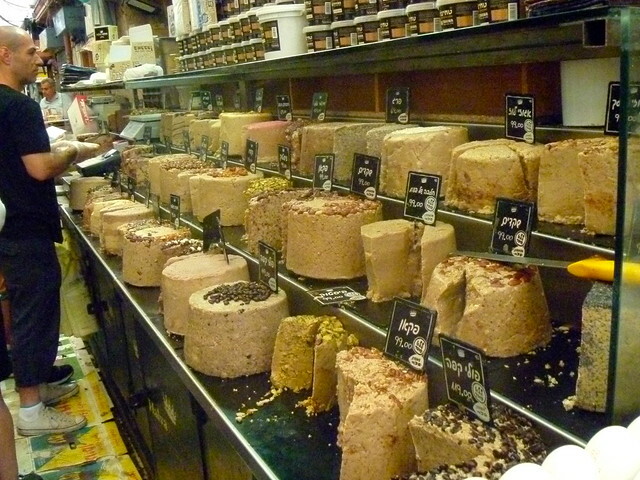 Possibly my favorite spot in the whole market is a big cart known as “Halva Kingdom”, which has dozens of flavors of halva: chocolate, coffee, coconut, mixed nut, cinnamon, poppyseed, and a million others I can’t remember. They even have a few sugar-free varieties. The best part? They happily give samples of any flavor you want to try, and it’s priced by the kilo, so they’ll cut you off a wedge as big or small as you’d like. Across the aisle from Halva Kingdom is a store that makes tahini, and I think they may be related because the two logos are quite similar. They make the tahini onsite and have a big machine in the back of the store that grinds the sesame seeds and then the finished product trickles out a little spout. The man there just held a tasting spoon under it and let me try the freshest tahini I’ve ever had, straight off the press. They also sell a variety of flavors, from spicy to chocolate (which I think would be great on ice cream). There’s also a huge variety of bakeries, from those specializing in bread (pita or laffa with za’atar or other toppings, or big braids of challah) to the bourekas vendors who have dozens of kinds of small pastries, both sweet and savory. 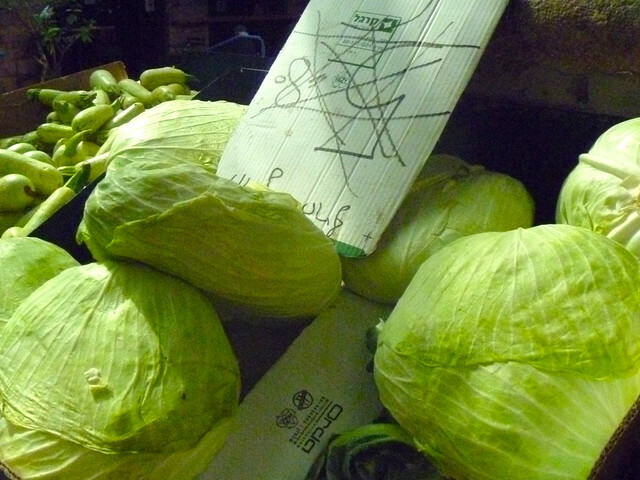 Grab a paper bag or box and a pair of tongs and go to town. They’re priced by the kilo too, so they can be cheap snacks. One day I got 8 or 9 assorted pastries for 8 shekels (just over US$2). Much cheaper than buying them at a cafe, where you would pay that price for just one! Then there are tables with trays upon trays of different varieties of baklava. I think I’m going to have to bring a huge assortment home, because I have never seen so many different types! There are also a number of restaurants in and around the market, if you’re looking for more of a sit-down deal. I ate at a Lebanese restaurant right in the center one day, and the woman who owned it was absolutely lovely and the food very good, though a bit expensive. There is also a popular place called Pasta Basta, which offers 4 different types of pasta, 5 or 6 sauces (including an interesting one made of beets), and a variety of toppings. It’s a fairly affordable place if you stick to only one topping (as it’s an additional charge for each), and very filling. Plus if you’re staying at Abraham and tell them when you order, they’ll give you a shot of limoncello on the house. After dark there’s also a bit of nightlife in the market, as after the vendors shut down, the restaurants tend to stay open and there are some bars as well.